Milo Baughman for Thayer Coggin large chocolate laminae Parsons dining table with two 20" leaves. Laminate does show surface wear in several areas, minor nicks. 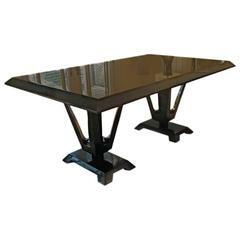 Can be used as a conference table, as it is 106.25" with both leaves. Retains original labels. Dining table in oak with double pedestals designed by Eleanor Forbes for Tapp. 6 foot long witnout the extension leaves,, two 18&quot; leaves. 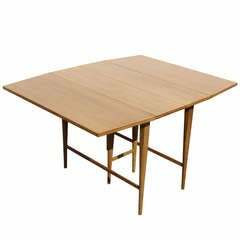 McCobb drop-leaf dining table with three extension leaves three 12" leaves for a total of 86.5" fully extended. Milo Baughman for Thayer Coggin burlwood dining table. Measures: 110" Length with both leaves inserted Each leaf is 22". This gorgeous Parsons style dining table is striking for it's burl wood veneered top, legs and skirt. It is in one piece and does not have leaves or additions. Vintage Milo Baughman for Thayer Coggin chrome X cross, zig zag dining table. Does not include glass top.